Miss Congeniality meets She’s the Man in this hilarious M!X novel about a girl torn between competing in a beauty pageant and playing on the boy’s baseball team. Gabby’s summer vacation isn’t shaping up to be that great. Her dad was just deployed overseas, and Gabby is staying at her grandmother’s house with her mom and baby sister until he returns. The one bright spot is that Gaby plans to sign up for the local softball league—her greatest love and a passion she shares with her Dad who was a pitcher in college. But when Gabby goes to sign up for the summer league, she discovers that there wasn’t enough interest to justify a girl’s team this year. And to top it off, a horrible miscommunication ends with Gabby signed up to participate in the Miss Popcorn Festival—the annual pageant that Gabby’s mom dominated when she was younger. Besides not having any interest in the pageant life, Gabby made a promise to her dad that she would play softball for the summer. 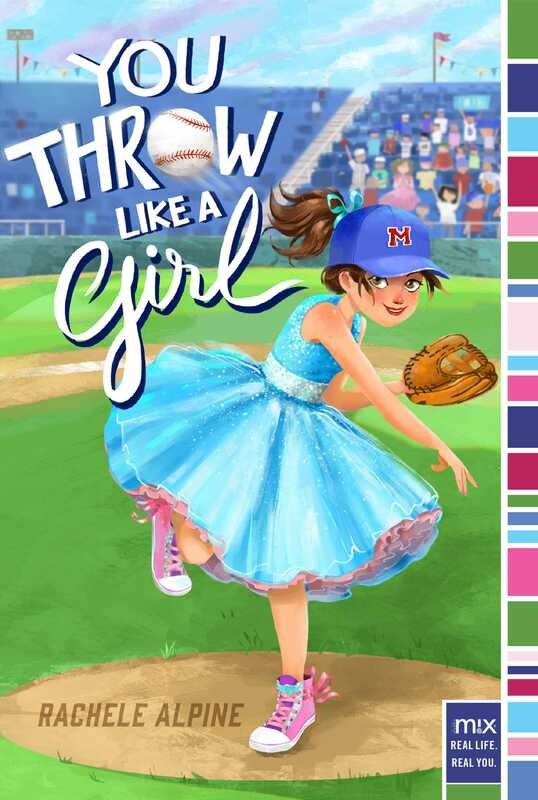 Since her pitching skills rival any boy her age, Gabby creates a master plan: disguise herself as a boy and sign up for the boy’s baseball team instead—and try to win the pageant to make Mom happy. Can Gabby juggle perfecting her pageant walk and perfecting her fastball? Or will this plan strike out? IT WAS THE FIRST DAY of summer vacation. Mom called it the Summer of Girls. And I called it the Summer without Dad. But the truth was, no matter what you called it, this summer was going to stink. How could it not, when I was trapped in a car, eight hours into a journey that was taking me far away from my friends, and a week ago we said good-bye to Dad as he started a year deployment overseas in a place thousands of miles away? Save ME PLZ!!!!! I texted to my best friend, Maddie. Come back PLZ!!!!! she texted back, and I wished I could. We crossed the Indiana border and passed a giant sign that proclaimed Ohio THE HEART OF IT ALL. Mom beeped the horn three times. I sunk down in my seat to avoid the confused looks of the people in the cars next to us. “Please, stop that,” I told her, but my protests didn’t matter. Mom beeped every time we entered a new state. “How else am I going to announce to everyone that we’ve arrived?” she asked. Ava thought it was hilarious, cooing each time Mom laid on the horn. I, on the other hand, wanted to disappear, from embarrassment. Especially when we’d crossed from Illinois into Indiana and Mom’s horn had startled the guy to the right of us. He’d shaken his fist and mouthed some words Ava was definitely not old enough to learn. “Are we there yet?” I asked for what was probably the fiftieth time that day. “Not much longer,” Mom said, which was the reply she gave me every time I checked. I had a feeling that if I had asked her the same question shortly after we’d pulled out of the driveway, she would’ve still said that it wouldn’t take much longer. I opened my mouth and let out a huge yawn. “This drive stinks,” I announced, but no one bothered to answer, so I rested my head against the window and watched the world fly by. I’d told Mom I’d give it a chance, but I wasn’t convinced this would be as “fun” as she believed it would be. So far my summer had consisted of nothing but endless fields, with the occasional farmhouse and cows. I was so bored that at one point I tried to count the yellow lines on the road, which didn’t work, because Mom always went over the speed limit and it was all a blur. We drove on, and another half hour ticked by, and then fifteen more minutes. I watched the world slip past outside the car window as we moved further and further away from our house and closer and closer to Grandma’s. Mom pulled off the highway, and we began to take side roads. I was one more winding road away from getting carsick when Mom pointed out the window. “Gabby, look, we’re getting close. There’s LaMarca’s Farm.” One of my favorite sites to spot on the way to Grandma’s house came into view. It was a two-story-tall corn statue that stood at the entrance of the biggest farm in the area. I’d never been so happy to see a giant ear of corn. It meant we’d made it. Buildings and streets began to look familiar, and I felt a tiny flutter of excitement. We’d visited enough times in the summer that it kind of felt like my home away from home. “Coneheads has orange swirl ice cream today!” Mom announced as we passed a small building painted with rainbow colors whose sign had a face with a cone on the top of its head like a hat. It was one of our favorite places to go when we visited Grandma, and who could blame us? Their chocolate chunk mint ice cream was the best I’d ever had. We drove through the tiny downtown with a bunch of stores and restaurants, and passed under a giant banner stretched across the street that advertised the Corn Festival. It had a countdown box announcing that there were sixty-one days until the annual event. Mom and Dad always made sure to time our yearly visit so we could go. It was a weeklong celebration with games, carnival food, rides, concerts, a beauty pageant, and most important, the championship game for the summer league softball and baseball teams. It was such a fun week. Everyone was in a great mood as they celebrated their biggest crop . . . corn! Mom said this year would be even more of a big deal because it was the fiftieth anniversary of the festival, so the town planned to waste no expense to make it as grand as possible. We left the main stretch of town and passed the recreation center, which was full of kids at the pool. But I didn’t care about the pool; it was the baseball field I was interested in. I watched a group of boys around my age playing a game, and I imagined myself on the pitcher’s mound. Mom had promised me I could join the softball team here, and I couldn’t wait to get out on the field and throw the ball around. But my good feelings evaporated quickly as I thought about how Dad wouldn’t be able to watch me play this summer. The car turned down Grandma’s street, and the empty feeling deep in my stomach became worse. Usually when we turned onto her street with the rental car my parents would get at the airport, Dad would drive super-slowly on purpose, which made me crazy, because all I wanted to do was race out of the car and jump into her pool. It was the best part of her house. I’d begged Mom and Dad for years to get a pool like Grandma has, but there was no budging them, so I made sure to get lots of swimming time in when we visited. Today was different, though. Mom didn’t drive slowly. She didn’t remember the joke Dad would play, and for the millionth time that day, I wished he was here. I couldn’t help thinking about him. How could I not? Mom said that I needed to keep my mind busy with other things so I wouldn’t miss him as much, but that wasn’t working at all. For either of us. I’d caught her a few times staring off into space with a sad look in her eyes, and I was pretty sure it was because she was thinking about Dad. But she was wrong. I’d never forget that he wasn’t with us. It’d been a week since we’d said good-bye to him, and we hadn’t heard from him yet. Mom said that as soon as he was able to, he’d contact us, but waiting was the worst ever, because I had no idea if he was okay or not. I didn’t say any of this to Mom, though, because I needed to be strong for her so she wouldn’t get upset. Dad had told me to try to do that, and I wanted to make him proud. I wiped my hands on my shorts and gripped the handle of the door. Even if Dad wasn’t here, I couldn’t break tradition. I was ready to get out of this car and jump into the pool. It was a ritual Dad and I had followed for years. We’d wear our bathing suits under our clothes, and before we even brought our bags into the house, the two of us would go for our first swim together. Mom and Grandma would sit on the porch with glasses of lemonade full of ice cubes, while Dad and I raced each other in the pool. We’d swim until our fingers were wrinkled like raisins and Mom told Dad to get out so he could start grilling. Even then, the two of us would eat at the picnic table in our bathing suits, not showering and changing until the sun had dipped deep down behind the trees. Mom beeped the horn one last time as she pulled into the driveway, and I was out the door before she even turned off the car. “I’ll bring my suitcase in later,” I shouted, and ran away before she could protest. I pulled my shirt off over my head and wadded it into a ball. I ran around the side of the house, wiggled out of my shorts, and threw them onto the back deck. I held my hands out and spun around, breathing in the familiar scent of fresh-cut grass and chlorine from the pool. As much as I didn’t want to come here for the whole summer, it felt good to be back, and maybe, just maybe, things wouldn’t be so bad. I thought about what Dad would want me to do, took a few steps backward, and then ran forward and, with a giant cheer, did a cannonball into the pool. Summer had officially begun! When I surfaced, I swam to the other side by myself, pretending Dad was right alongside me.